With a stay at La Locanda di Piazza del Popolo in Rome (Flaminio), you'll be minutes from Santa Maria del Popolo and Piazza del Popolo. This guesthouse is within close proximity of National Gallery of Modern Art and Villa Borghese. Make yourself at home in one of the 10 air-conditioned rooms featuring minibars. Complimentary wired and wireless Internet access is available. Bathrooms have showers and hair dryers. 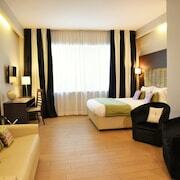 Conveniences include safes, housekeeping is provided daily, and cribs/infant beds (surcharge) can be requested.